"To Victor - Good Luck Tarzan"
I am in a large studio building on the RKO lot. I am dressed in my Cub Scout uniform along with almost 150 other boys from other packs. 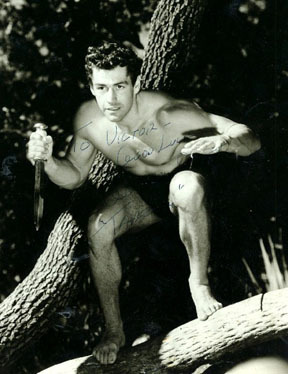 I have been chosen by my pack to try out to be Tarzan’s son for Gordon Scott's upcoming picture. Several producers are sitting behind hastily set up desks and are interviewing the cub scouts. At the end of each interview they send the scout to either a small group of boys on the left or a larger group on the right. We are excited but trying to remain quiet as the producers have requested. Finally it is my turn. I sit in front of the man and answer questions about myself but I am completely on autopilot. I can't think of anything except the extraordinarily large wet cigar in his mouth. I am hoping I won't have to work with him because he keeps chewing on it and it looks so gross. Finally he is done and motions me to join the small group on the left. At the end of the interview there are five of us. The group on the right is being given autographed pictures of Scott and sent home. When they are gone Gordon Scott comes out. I can’t believe it I am standing right in front of Tarzan, although his is wearing a suit and that seems kind of strange. He walks up and down the line of five asking each of us questions. The kid on the end has just wet his pants and they re hustling him away. None of us laugh however because we know it could easily have been one of us. I silently thank my mom for making me go before we came. Gordon comes to me and says, "Can you swim?" >From somewhere inside my head I hear myself answer yes. Then he asks, "Are you afraid of anything?". The thing I am most afraid of is Gary Sims but I realize that Tarzan doesn’t know Gary so I try to think what Tarzan would know about and finally I blurt out, "Crocodiles". He looks at me in a funny way and moves on. When he is done he signs pictures for us and the producer says he will let us know. The next month at the jamboree we meet the kid who is Tarzan’s son. They didn’t choose any of us. Instead they chose a star and then made him a Cub Scout. I still have Tarzan’s autographed picture.